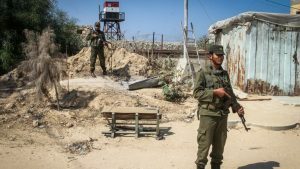 Three Gazan workers were briefly kidnapped by masked gunmen, believed to be jihadists, in a tunnel at Rafah crossing on Monday, before they were released. Hamas-run interior ministry and eye witnesses confirmed the incident which underlines the security issue on the border between the enclave and Egypt. Iyad al-Bazm, spokesman of the interior ministry in a first step mentioned the Islamist movement as the instigator of the kidnapping but later issued another statement that the three workers were found on the border and had been returned to Gaza. The security situation at and near the crossing has always been a thorny issue between Cairo and Hamas. Cairo accuses Hamas of using tunnels near the crossing to smuggle food, weapons and fighters in and out Gaza. Egypt also says jihadists in the Sinai use tunnels to escape inside Gaza. Last week, Egypt maintained closed the Rafah crossing after jihadists in the Sinai attacked Egyptian security forces near the border, killing many of them. Egypt is facing a brazen insurgency in the restive Sinai province where terror groups, including the Islamic State group have been staging attacks on security forces. Written by: KanelkaTagba on October 24, 2017. Posted by KanelkaTagba on Oct 24 2017. Filed under Headlines, World News. You can follow any responses to this entry through the RSS 2.0. Both comments and pings are currently closed.